Providing you the best range of dust monitor with particle counting, dust monitor and air quality monitor with effective & timely delivery. 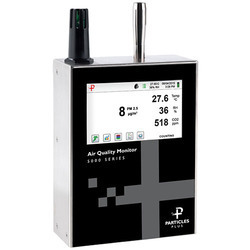 The Particles Plus 5301-AQM and 5301-AQM Air Quality Monitor measures PM1, PM2.5, PM5 and PM10 particle mass concentration, temperature, relative humidity, CO2 (and TVOC in the 5302-AQM) values and stores up to 45,000 sample records for comprehensive or long terms air quality studies. This wall- mounted instrument is the most versatile air quality monitor available for fixed installations with an intuitive large touch screen display. 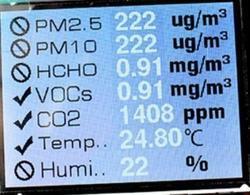 The instrument provides 6 user defined channels of particle counting with a wide array of alarm features. The AQM Series can easily integrate into a building automation and facility monitoring system via Ethernet, USB or (optional) Wireless 802.11 b/g, RS485 or RS232. The Particles Plus AQM Series Remote Particle Counter and Environmental Monitor measures 0.3 µm to 25 µm particles with mass concentration and stores indoor air quality measure-ments of temperature, relative humidity, CO2, and TVOC in the 7302-AQM. This instrument is the most versatile remote Air Monitor available, with advanced power management and the industry’s first sleep mode, allowing for battery operation of periods that can exceed a month on a single charge. The AQM Series can be used as a stand-alone battery operated instrument or it can be easily integrated into a building automation and facility monitoring system via Ethernet, USB or (optional) Wireless 802.11 b/g, RS485 or RS232 connection.